Breast implants come in as many shapes, sizes, and varieties as natural breasts do, and figuring out all the details on your own can be overwhelming! Ultimately, the decision about what size and type of implant is the best choice is up to you—but you’ll need a little extra help along the way. With decades of combined experience, our cosmetic surgeons Dr. Haiavy, Dr. Tower, and Dr. Florin can help you understand all of your breast augmentation options and choose the perfect breast implants for you. Taking your goals and natural anatomy into account, they’ll make expert recommendations on what will help you achieve the look you want. 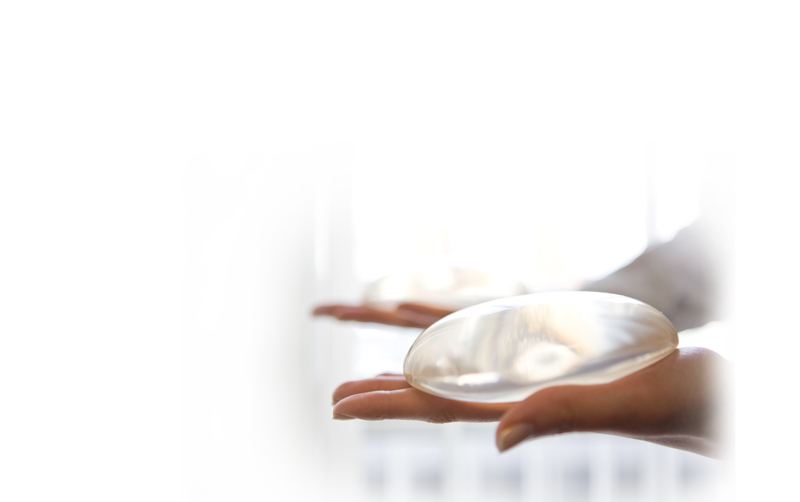 In the meantime, we’ve rounded up some key information about breast implants so you can start comparing your options. What’s the difference between saline and silicone? Composed of a flexible silicone outer shell and filled with sterile saltwater, saline breast implants are a great option for some patients—and until recent years, they were the most used type of implant in breast augmentation. Saline breast implants are inserted into the breast pocket empty and then filled during surgery. This allows your surgeon the ability to adjust final implant volume during surgery so they can correct any asymmetry—and it means that a smaller incision can often be used. These days, most patients choose to have silicone breast implants for their natural look and feel. Rather than being filled during surgery with saline solution, silicone breast implants are pre-filled with a cohesive silicone gel that closely resembles the natural characteristics of breast tissue. The latest generation of silicone breast implants are better and safer than ever, thanks to nearly 20 years of safety studies and advancements in implant technology. The medical-grade silicone used in breast implants is used widely in healthcare. If a rupture occurs, it can only be detected by MRI or ultrasound, which the FDA recommends having three years after surgery and then every two years after. What size breast implants should I get? Every woman is unique, and your body type and personal preferences will dictate which size is best for your lifestyle and aesthetic goals. We would love to help you make this important decision! Of course, your starting breast size is important to consider, as well as your chest wall (or bra band size) and shoulder measurements. This means that the size of implants that looks great on a friend of yours are likely to look quite different on you. For instance, a 300 cc implant could create a generous augmentation for a petite 5’ tall woman with a narrow chest wall, while the same implants will only offer a modest-looking augmentation on a 5’ 10” women with substantial shoulders—she might need 450cc implants to get a similar look. Choosing a size can be difficult for some patients. You may find it hard to imagine what it will feel like to have larger breasts. We’re here to help and encourage you to come in for a private consultation, during which you can try on breast implant sizers and discuss other key options, including amount of projection (implant profile) and implant shape. We’ll also provide an exact fee quote. We would love to help you determine an ideal implant size and shape. Should I get round or shaped breast implants? By far the most popular option, round breast implants are circular in shape and help provide fullness to the upper breast—and despite their name, they look very natural and can be customized further by width and projection to fit your body proportions. Round implants are soft and have a consistent shape, which means they cannot “rotate” in the breast pocket or create issues with symmetry. Round implants are a great option for most body types and can create a beautiful result whether you have very little natural breast tissue or were voluptuous pre-surgery. On very thin women, however, round implants can sometimes look more augmented than natural. Though they aren’t shaped, round implants are susceptible to gravity and will take on somewhat of a teardrop shape over time and after the implants have settled. Our patients have found that their round breast implants look very natural over time. Shaped implants, or anatomical breast implants, have a teardrop shape meant to mimic the natural shape of breasts: narrower at the top and fuller at the bottom. Because these implants have a molded shape, they are a bit firmer than round implants. Because they are made with highly cohesive silicone gel, shaped breast implants are form-stable, very durable, and have a low rate of rupture. Over time, anatomical breast implants will maintain their shape. We have found that women who have very little natural breast tissue benefit most from teardrop implants, which add shape and structure. Nothing can replace the value of talking with an experienced cosmetic surgeon, exploring your options, and getting to look and touch different breast implants (and even try them on for size!). Our superb surgeons, Dr. Haiavy, Dr. Tower, and Dr. Florin, would love to help you find the best fit for you during a private consultation. Contact us today to get started!